We all go through hard times, disappointment and pain. But how are you dealing with it? How is it affecting you? Read Ruth 1:1-5 | Write out the bad things that happen to Naomi. Read Ruth 1:6-18 | Write out the good things that happen to Naomi. Read Ruth 1:19-21 | What does Naomi focus on? Naomi has a lot of bad things happen in her life and because of her firm faith in the sovereignty and providence of God, she assesses that God’s hand has been at work in this bitterness. And she is right; God’s hand of judgment has been on her family and she has suffered personally for it. But what is she missing out on? She doesn’t see God’s hand in bringing good things to her too. She doesn’t see that He provides the food that paves the way for her return to the covenant land of blessing and rest. She doesn’t see the highly unusual loyalty and love from her formerly pagan daughter-in-law, Ruth, who gives up everything to be with her through her pain. She misses out on the blessings and only focuses on the bitterness. Now, I don’t blame Naomi for this. It’s the human way. I do the same thing. When I have problems my vision becomes very near sighted and those troubles become the defining features of my life. Yet, when I read chapter 1 of Ruth, I discover that I don’t want to be the person that misses God’s good things even when I am suffering from painful things. I’m not advocating just “positive thinking” or even for you to forget your problems, but rather for us to have eyes open to the greater works of God. It’s not about your glass being half-empty or half-full, it’s about knowing where the water is coming from; it’s about raising your eyes to the Source. This doesn’t mean that you stuff your problems away, stop bringing them before God or keep from sharing with others, but it does mean that you express your faith in God by taking time to look for, thank God for, and share with others the good things in your life as well. 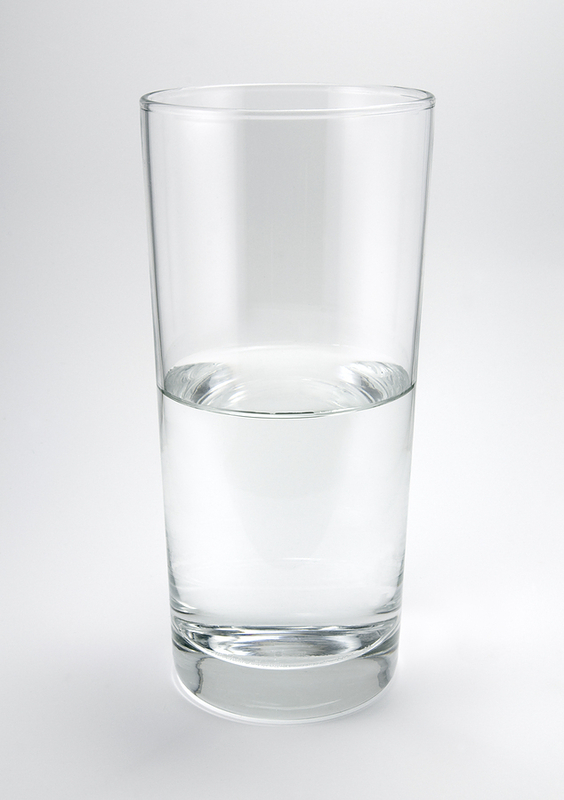 It’s not about your glass being half-empty or half-full, it’s about knowing where the water is coming from; it’s about raising your eyes to the Source. So, here’s what I’d encourage you to do. If you find yourself regularly bummed out or depressed because of the harder, more bitter things in your life: Make a list of the bitter things (that you will continue to pray for, work on and share with others) and then make a list of the blessings (and try to make that list 3 times as long). But, how do you do it? How do you find the good things to list out? Pray. Begin to ask God to open your eyes to His hand of blessing at work in your life. Provision. Think of how God is providing for your normal daily needs. People. Think about the people God has brought into your life, specifically other believers that God is working through to show you His love. Ask others. Maybe you really are like Naomi and you just can’t see it. Then it’s probably time to meet with a close friend and tell them your chapter 1, and let them help you read between your bitternesses and help you find the sweet that God is already blessing you with… even as you continue to pray for the harder things to be resolved. Christ. Ultimately, we have been given every spiritual blessing in Christ. His death in place of ours. Our life filled by His. If we forget this, we will become bitter, because we will encounter very difficult things like cancer, unemployment, death of loved ones and more, and it will be the love of the One who entered our pain beyond what any other friend can ever do, that will help us to still see God’s smiling face. How did it work out for Naomi? Well, God’s blessings became too much for her to ignore. In chapter 2, verse 20, she begins to admit that God has not stopped in His kindness, like she had first thought. And by the end of the story, the same women she told to call her “Bitter” praised God for providing her with redemption. We will go through hard times, it’s unavoidable, but even then God has not stopped in His kindness toward us, and in Christ God has provided for our redemption, leading us to glory. An easy assumption to make when it comes to reading our Bibles is that if you want to go deeper into the text then you need to purchase a bunch of scholarly resources: commentaries, introductions, lexicons, study Bibles, etc. Now, while these are all great resources and will help expand your understanding of the text, too often we move to these far too soon, or we are simply intimidated into inaction because we don’t own these already. The truth is that pastors and Bible study leaders are served well to do their own thinking through and analysis of the text prior to moving to other resources… it is also true that anyone wanting to go deeper or be more prepared for receiving a sermon or participate in a Bible study would also do well to tackle the text on their own. So, how? 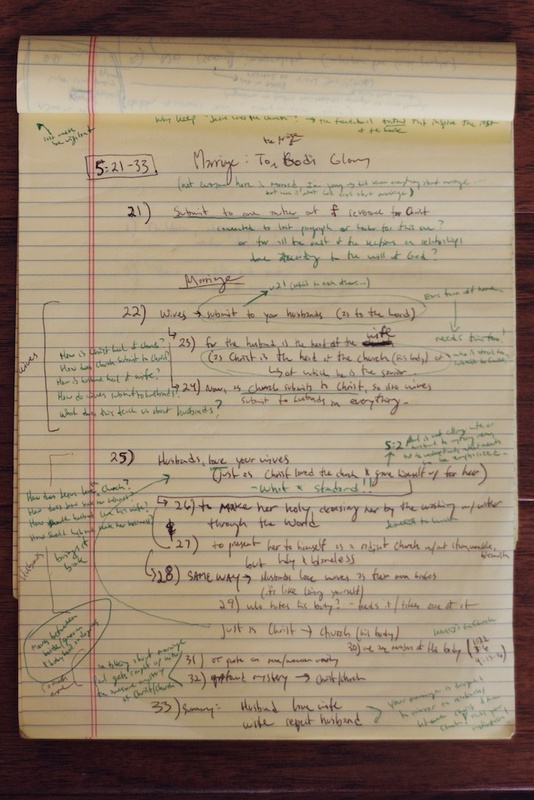 Well, there are a lot of different methods and ways, but I wanted to share some simple steps that make up the beginning of my sermon preparation. (This isn’t necessarily the best possible methodology, but it has worked for me thus far, and it’s pretty simple). Prayer. Thank God for His Word and your ability to study it. Repent of sin which can cloud your thoughts and the work of God in your life. Ask the Spirit illuminate your time of study. Big Picture. Now, we have been in a continuing study of Ephesians and I have constantly tried to place each week in the context of the whole book and point out its individual relationship to the previous week’s text. If you have been part of a study like this then you may already feel good about seeing where it fits in the big picture of the book. If not, then this is a step that you can put a lot into (read the whole book, give a summary to each chapter) or a less (read the paragraph before your section and after to see if it modifies how you might read your section). Read it. Read the section over a couple of times and write down your first impressions of it (what stands out, what seems important, what do you want to know more about). Line by line. Go verse by verse down a sheet a paper writing out your own paraphrase of each. If some verses or statements have a specific relationships or connections to others, make some visual note (arrows, or indent) to show those relationships. Group. Group paragraphs together and by looking at your paraphrases of the individual verses, come up with a general title or paraphrase of each paragraph. Then give the whole section a title if you can. Interrogate. Grab a different color pen and start marking things that seem important (repeated words, emphasis), write out questions you have that you hope to find answers to and write down other verses in the Bible that these make you think of. Now you should have a good idea of what you think this section of scripture means, what’s important and what things you’d like to find answers to either in further study (resources) or from the sermon or Bible study you’re attending. Now, this doesn’t always mean that you have it all figured out… many times I’ve moved onto the next step of checking with how scholars understand certain things and I’ve found myself to be way off, but at least I knew that I wrestled with it. Other times I’ve been pleasantly surprised that I actually had some good thoughts that I shared with smarter people. I hope you’ll take some effort to try even a few of these steps and work it into some of your regular time of study. If you’ve already figured out what works for you to get deeper into the text, great! Keep with it! But if not, try these; it will take a little longer than just opening your Bible, reading, and shutting it… but it is worth it to not only wrestle with the text, but to let the Word of God wrestle with you. 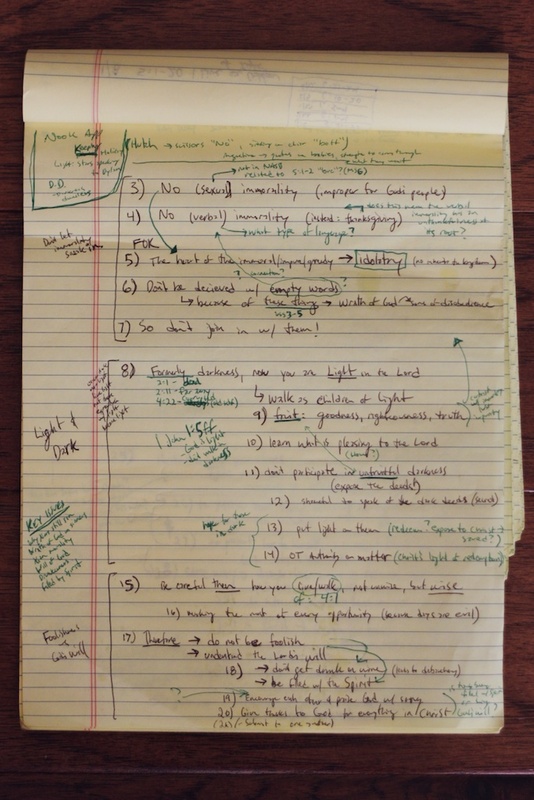 My notes from Eph 5:3-20 (teaching at Remix on Jan 8). Let the Word of God wrestle with you! Last night we broke in. But we didn’t get arrested. In the 2000 years that have passed since Paul’s writing (and imprisonment) Christians (specifically American Christians) have a lot more freedom in regards to breaking in to the Bible and breaking out the Good News of Jesus. I recognize that a lot has changed in America since its founding and even since the 1950s, but I am still grateful that we can hold publicly announced meetings like last night and the people attending don’t have to fear being arrested. (By the way, it was our first “South Shores Remix” and it went great… thank you for those who prayed and thank you for those who came and served). First, a word about manuscripts… since there was no Xerox for the majority of the history of the Church, the copying of Biblical books and letters has been done by hand. Great pain-staking detail was given to this task, but inevitably, over time, human error would creep into some copies. This could be by accident (ever copied something down only to find that you wrote the word “the” twice?) or by intention (ever copy something down that seemed odd and try to make it sound a little “better?”). The wonderful thing is that there is a wealth of manuscript (handwritten copy) evidence for the entire New Testament. Not only are there many, many copies available to cross check, but we can even track these copies through different locations and theological traditions, and even into other languages. This gives our modern scholars a wealth of evidence to make sure that what we have is the actual thing. When they bring the differing manuscripts together they give extra points to the one that is older, the one that is harder (people like to make changes to make things easier, not more difficult), the one that is shorter (people like to add), and the one that better explains how the other one came from it (and not the other way around)… (there are other factors too, but I’m working off what I remember from my Intro to Exegesis class which I took pre-baby… so I’m keeping it simple). And just in case new evidence arises, or scholars aren’t settled on the issue, the editors of your English Bible put little foot notes, or margin tags that note whether certain words are disputed or not and why. 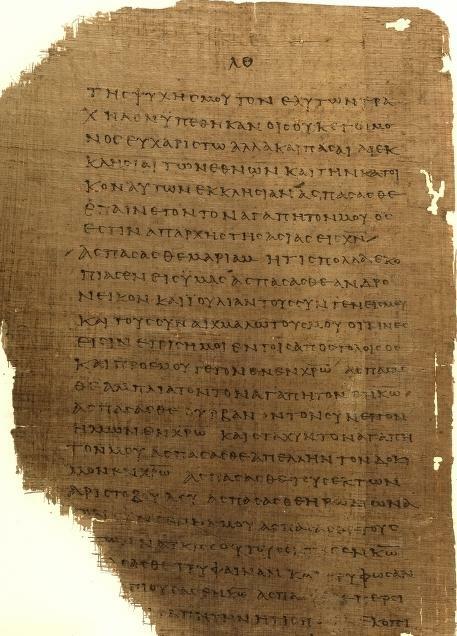 One of the early manuscripts... a papyri known as P46. Pictured here is Romans 16. The letter itself does not have some of the similar hallmarks of other Pauline letters. It is not very personal and it does not speak to any specific situations going on in the church of Ephesus that need to be addressed. (In 1 Corinthians we see him addressing theological division in the church (calls them “infanfts” – ouch), in Romans he greets many specific people, and just read Phillipians 4 to see some warm love and personal interaction). There are some scholars (but not the majority by any means) that think this could be that letter, since an old heretic (Marcion) of the early church quotes from Ephesians, but refers to it as the letter from Laodicea… (personally, I tend not to trust heretics much further than I can throw them – and I’m not very strong). And so the sharing of letters between churches is documented, but Colossians was still first sent to the church in Colossae and the manuscripts testify to this, why not Ephesus? Or better yet, why “at Ephesus” in the majority of manuscripts, but not the early ones? Well, if it was intended as a circular letter it is possible that it was attached to Ephesus as the primary recipient because it was the chief city of the area. And possibly Ephesus became the primary city to go about distributing copies of Paul’s incredible letter. So, who cares? What does it matter if this is a more general letter or a specific one to a certain city. Well, when studying the letters of the New Testament (epistles) you need to study the location and the events going on in order to help you understand the nuances of what Paul is saying to them. In Ephesians we do not need to do this quite so much. Everything Paul is saying to them (in a first century lens) is very easily applied and understood by us as well. So, in the midst of all this manuscript stuff and circular letter business is the hope that you can sit down, read through this short letter and successfully begin to know God better, Christ better, the Church better and therefore how you must live. It is a good letter, and it is intended for us as well. Read it this week… all the way through in one sitting (six chapters, 15-20 minutes).